Xiaomi Mi 8 SE is a stylish smartphone with a striking design that makes the phone more attractive. This device has several aspects that may appeal to users, such as superior performance, adequate internal storage capacity, and most importantly, camera settings that can be easily described as amazing. This device has additional features, including a fingerprint sensor and fast charging options. Therefore, if you are one of the Xiaomi fans, you must view this device. The Xiaomi 8 SE features a 5.88-inch AMOLED display with a screen resolution of 1,080 x 2,244 pixels. The AMOLED display adds brightness display with a screen resolution of up to 424 PPI, making the display clearer. The camera is equipped with a 12MP and 5-megapixel dual main lens with an aperture of F1.9. Features such as two-color LED flash and autofocus improve the quality of the captured image. For self-timer enthusiasts, the device is equipped with a 20MP front camera that further complements the soft flash. The quality of the captured selfies has reached the standard. The device's configuration side is supported by two processors, such as the 2.2GHz Kryo 360 dual-core and the 1.7GHz Kryo 360 Hexacore. The presence of 4GB of RAM enables smooth performance when handling heavy multitasking. The processor is based on the Qualcomm Snapdragon 710 chipset to improve device performance. In terms of storage, there is 64GB of internal storage capacity to compensate for the lost expandable memory card slot. The device is powered by a 3,120mAh lithium polymer battery and is available with a fast charge of v3.0. Taking into account the strength of the battery, it provides an average battery backup. 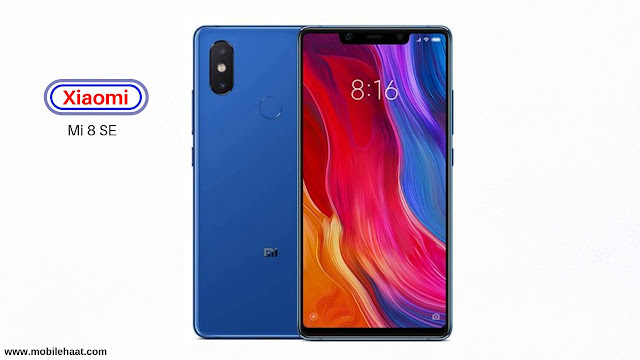 As for connectivity, the Xiaomi Mi 8 SE is equipped with many options such as Wi-Fi, mobile hotspot, Bluetooth, GPS, USB Type-C and 4G with VOLTE.